Trees have always been an inspiration in my life. 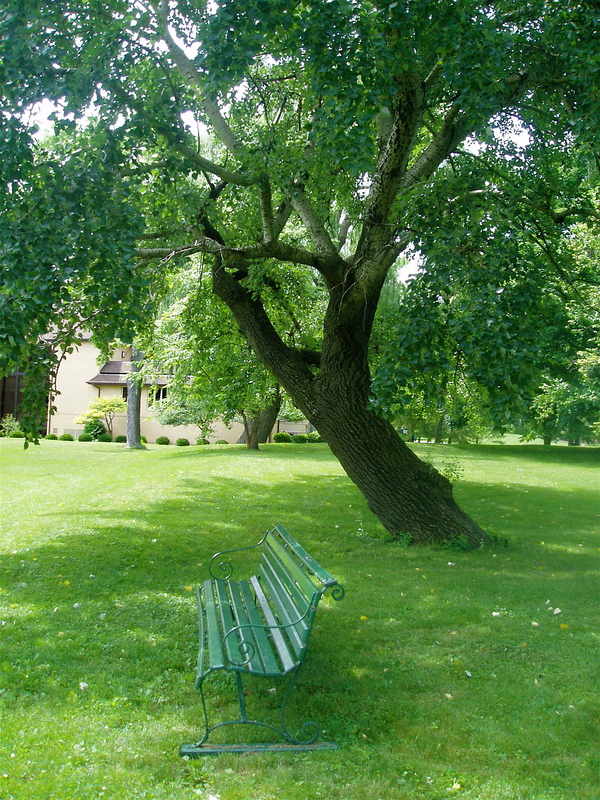 I can remember at a very young age—through high school actually—climbing the giant elm in the front yard. I can’t really say what drew me there—but I do know that sitting in that tree, I felt—well, at home. Of course I’m amazed at their rooted stability and their resilient flexibility in the ravages of a storm but there is something more—something I can’t really pinpoint that draws me to trees. Perhaps this project, this story— is the quest for understanding. As an artist, I fell in love with letters, (didn’t we all?) —handwriting, type, calligraphy, graffiti. I was fascinated with the concept of visible language and I fell in love with the act of making it and the materials it required. I fell in love with the translucency of watercolor and opaqueness of gouache, the sultry smell of ground ink sticks and the rich dark color of sumi. I fell in love with all kinds of pens, nibs, inkwells, brushes and funky things with which to write—and paper, most specifically handmade paper. 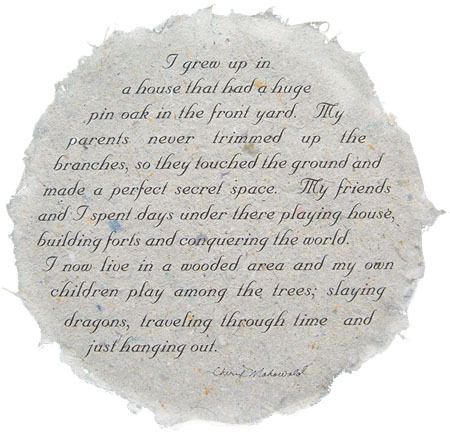 I fell in love with handmade paper—the visual, tactile quality, and the way the ink flowed onto the fibrous surface. It was not just a substrate or a ground on which to work—it was a creative dance partner. I needed to know how to make paper. I needed to be involved in the entire creative process. 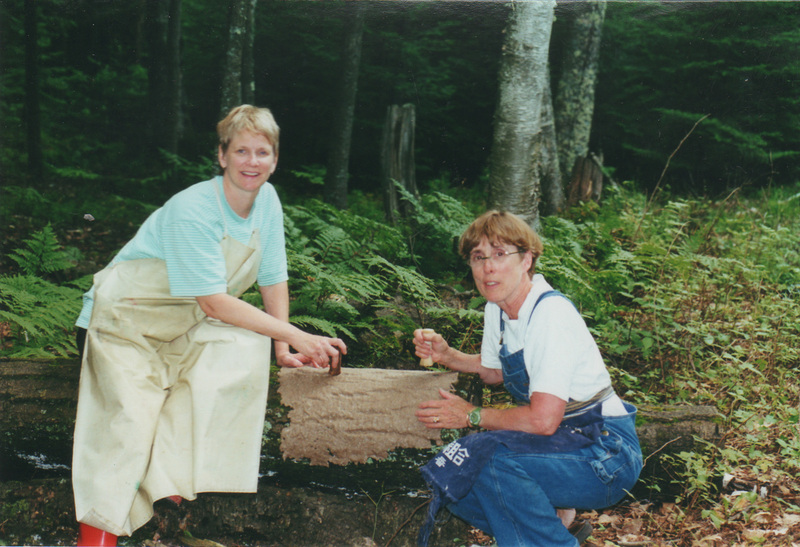 Marilyn Sward, my mentor and friend taught me how to make paper. I would venture to say that she taught thousands to make paper. My early morning bike rides I have come to learn are a meditation. Meditation wasn’t really my intention—and to be honest, most of my rides start with incessant mind chatter as I head out through the alley onto residential streets to get to the bike path in the woods. The yammering continues even as I ride along the lagoon watching the geese mill about—but I’m starting to take note. 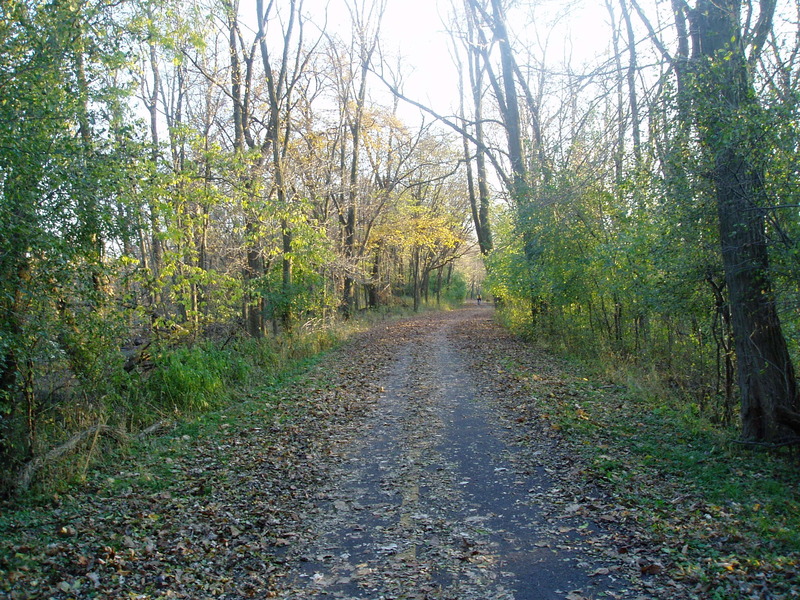 The first noisy half of the ride is followed by a quieting of the mind—stillness, awareness and presence—presence of the bike path—the yellow center line and tar filled cracks, presence of the bird’s soaring, the trees marking time in the season, the single leaf falling prematurely in the early summer and those few leaves still clinging to the branches when all the others have fallen; presence to the wind on my face, the cerulean blue sky, the native grasses bowing to the breeze and an occasional deer who guardedly turns to watch me ride by. It is in the quieting of the mind—the second half of the ride where ideas, visions, voices, intuitive insights—call them what you may—present themselves. It was there, in the quiet mind space, where with a sideways glance into the woods I first saw Treewhispers —and it was there many weeks later the name was whispered—somewhere in that space between letting go and listening. My schedule for that day included dropping off artwork at Marilyn’s house for an exhibit that she was curating. I had instructions on where to leave the work if she wasn’t home—she usually wasn’t. Marilyn was always on the go—yet, much to my surprise and in the spirit of synchronicity, she was home. She invited me in and excitedly I shared the idea of the trees, the paper, and the vision. We talked and brainstormed for hours—knowing the ideas being conceived were not about us, but rather about the trees, the earth, the people, and paper—the stories and their connections. The inception of Treewhispers was there on Marilyn’s front porch in Evanston on that warm summer day. She had a papermaking studio by their summer home in the northern woods of Wisconsin. We later headed up there and made hundreds of paper rounds to seed the project. Marilyn took them to the International Papermakers Conference in Italy in the year 2000 to include in the participants keepsake and to kick off the project. We spread the word, in a Johnny Appleseed kind of way, telling everyone we knew and asking him or her if they had a tree story—you know, did you ever climb a tree or build a tree house? Do you have a favorite tree? Did you ever plant a tree and watch it grow? Did you ever name a tree? Our first box of paper rounds came from an elementary school teacher from Gurnee. It’s one of those stories which seems so ironic, she came to a garage sale I was having, after looking around, asked if I was an artist. (As a side, note my daughter once commented that our stuff looks different from other peoples stuff!) Well, her interest in my stuff was all the introduction I needed—I shared information about the project and she was excited about the possibilities. She proceeded to make paper with an entire elementary school—directed not from the luxury of an art room but from an art cart! I salute her! The children ripped up their homework—blended it with water in a household blender and used embroidery hoops for papermaking moulds to make round sheets of paper. Wet round forms were placed on the windows to dry and when it was dry they wrote their tree stories and painted their tree pictures. 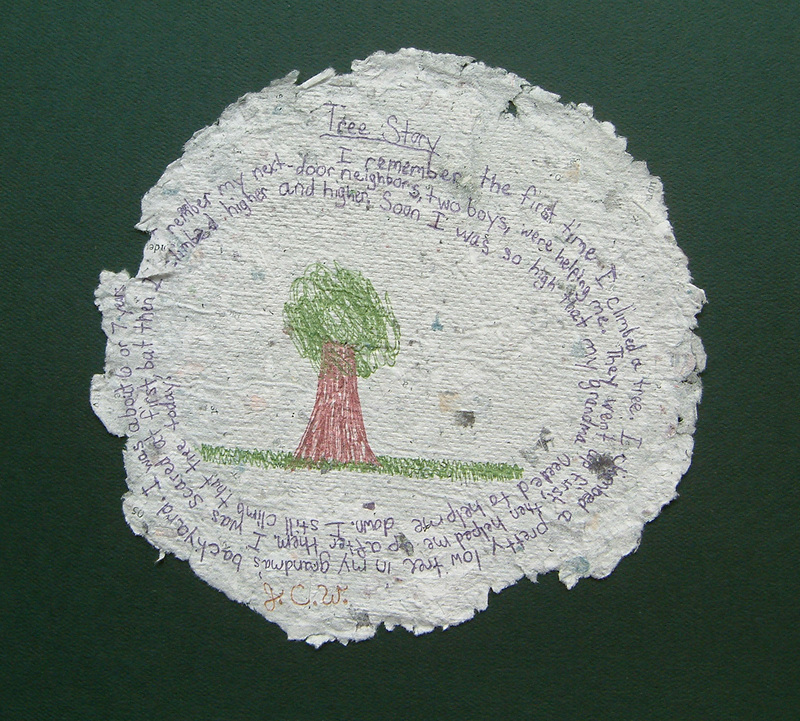 And so we bound our first tree from paper rounds submitted by an elementary school teacher in Gurnee, IL. Now looking back on it, binding that tree seemed somehow sacred. It reminds me of quilters who bind not only the fabric and thread but also the time shared in this physical act, the conversations and laughter and in some sense for us was the additional binding of the time, stories and conversations of those who made the paper, wrote the stories and drew the pictures. Technically speaking we decided to bind the trees in 5-6 foot segments so that we could customize the height of the tree—and alter the segments—one segment might be near the ceiling in one venue and eye level in the next. Bookbinding thread is used to bind them and each paper round is stabilized with a small disc and lead weights. Contributions started to roll in; sometimes it was only one in an envelope, sometimes a box showed up at the door. Each and every paper round unique! Two young students from Washington included the project in their art and science fair—explaining the origin of paper and hydrogen bonding while demonstrating the process of papermaking. 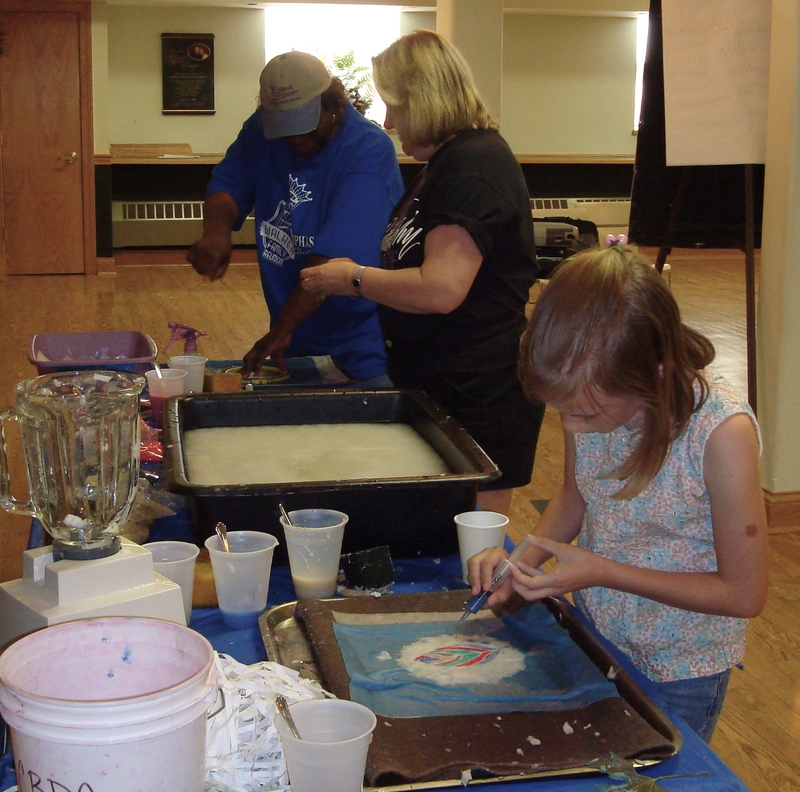 The project has been an impetus for many to learn about the art, craft and chemistry of papermaking by calligraphy and papermaking guilds, colleges and universities, elementary and high schools, home schools, nursery schools, 4H groups and Scout troops. Professional artists have created work specifically for the project; writers have shared their stories; and biologists, foresters, and botanists have shared the technical view from their field in stories and pictures. Child life specialists have worked with children in the hospital setting—tearing and shredding paper, sometimes their own drawings to make something new. Parents have written stories for children too young to write and young adults have gleaned stories from their elderly friends in the nursing home, too crippled to hold a pen. 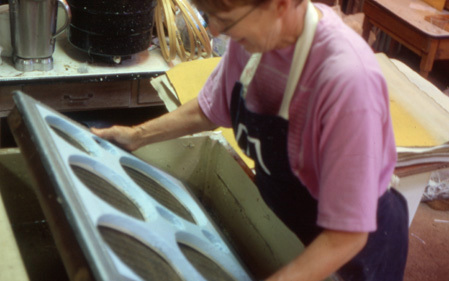 Papermakers in Victoria, Australia had a day of papermaking and exhibited the work in a gallery before sending it. Calligraphers and participants at the Day of Renewal in Indiana joined in and the tree huggers were rallied at the Odyssey Conference in 2001. Marilyn and I schlepped buckets of pulp and papermaking equipment to the Field Museum, the Morton Arboretum and the Kohl Children’s Museum to share our love for paper, for the earth—teaching others a simple papermaking technique involving recycled paper. We’ve seen the delight in the faces of those who were willing to put their hands in water to make their first sheet of paper. The website has provided an alternate forum for story sharing and connecting to others around the world. Stories range from funny to frightening and some will make you cry. They are all unique yet a common thread runs through them all. 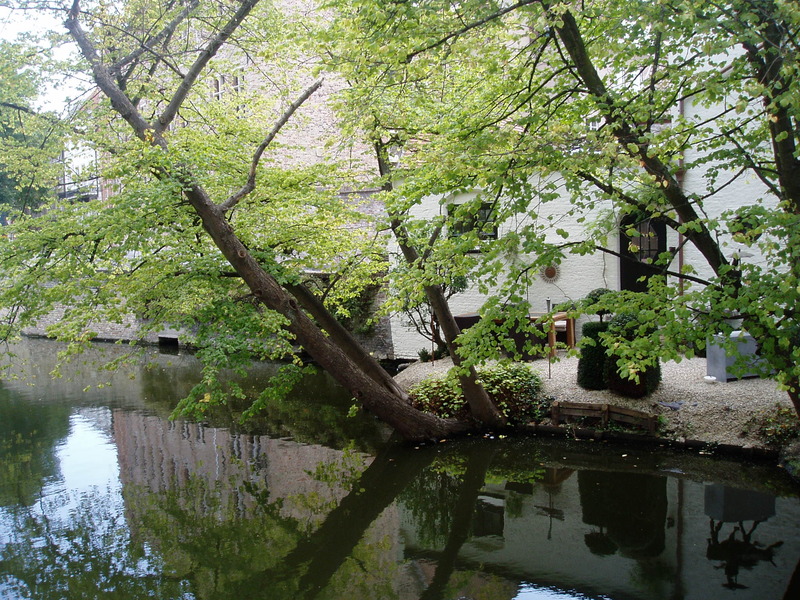 The project has provided a space for pausing and remembering a tree, perhaps providing a brief moment of gratitude to the miraculous aspects of trees. Marilyn and I realized from the start that this project was not about us as individuals—but rather about the trees, the earth, the people, and paper—the stories and their connections. The stories are not about historical chronologies necessarily, but rather about commonplace stories, personal experiences and observations where details merge into awareness. Together we create a panoramic vision of our earthly experience. The project has always had an energy of it’s own—like seasons, not always congruent with ours might I add. 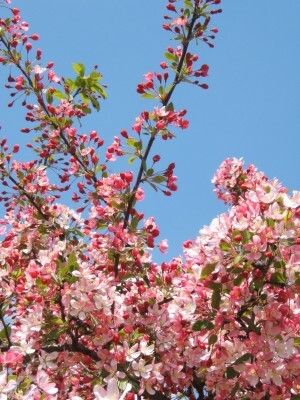 I suppose I could liken it to planting a tree with a lot of nurturing and watering initially, knowing that there is a time for new growth and blossoming, a time of great autumn beauty and a time of dormancy—each season significant to the cycles in life. On a walk recently I was marveling at a pine tree in the snow loaded with little pinecones. I just stood and looked at them in awe—had I not really seen them before? I thought of hope, new life that these little pinecones held within them—the promise of a tree, many trees actually. I thought about the quiet spaces of time in which these little pinecones grew at the end of the evergreen branches—the miracle of life. 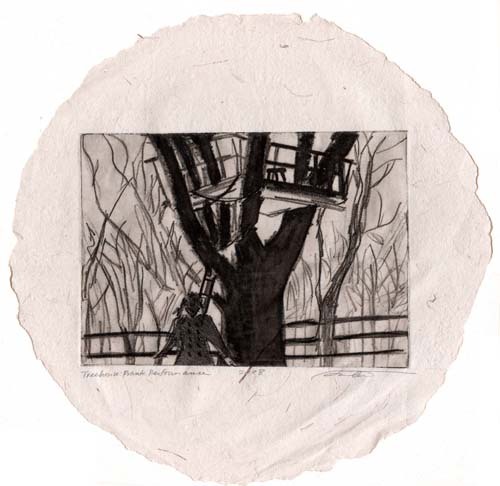 And so the invitation stands: you are invited to make paper for this ongoing project, to share a tree story. You are invited to join in the connection to trees and the earth, to others and their stories. I invite you too, on your next walk, even if it’s to get to your car or the grocery store, to look at a tree and consider the roots which reach deep in the earth to sustain it, to consider the leaves which create the shade for you—absorbing the sunlight for photosynthesis, to consider the sap rising, consider this tree—a living thing in symbiotic relationship with us. Put your hand on the trunk or a branch and consider what lies beneath it. Close your eyes, touch the bark—smooth or rough, smell the earth, listen for the rustling of the leaves or perhaps the silence. 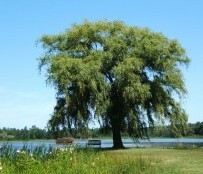 I forgot to say a few moments ago, what a great name -Tree Whispers. Then I read your story here. Your writing is beautiful and inspiring. I’ll be doing a Papermaking demo in my studio at the end of June and will share this and have attendees submit their art also. I want to walk through those trees. When are you near Baltimore, MD?